Our bodies are rainforests of microbes feeding off the leftovers from our meals and contributing to a variety of body odors. 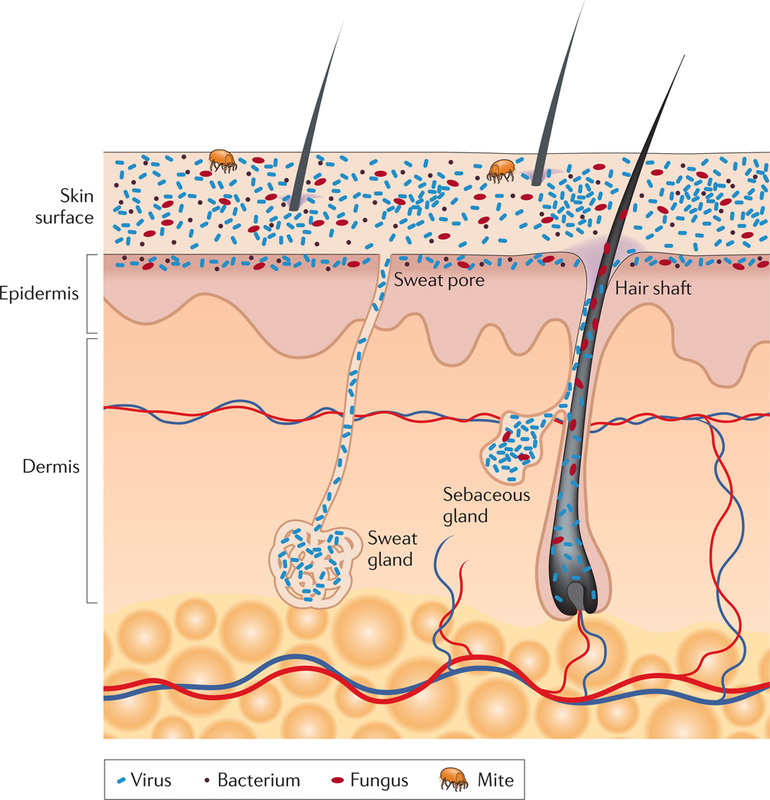 Human skin is inhabited and re-populated depending on health conditions, age, genetics, diet, the weather and climate zones, occupations, cosmetics, soaps, hygienic products and moisturizers. All these factors contribute to the variation in the types of microbes. Population of viruses, for example, can include a mixture of good ones – like bacteriophages fighting acne-causing Propionibacterium – and bad ones – as highly contagious Mesles. Bacterial communities include thousands of species of Actinobacteria, Bacteroidetes, Cyanobacteria, Proteobacteria, and fungi Malassezia. Nat Rev Microbiol. 2011 April; 9(4): 244–253. These microbes form communities and have active social lives, cooperating to our good and bad experiences. They converse chemically – in many specific dialects and in universal Esperanto-like languages some of which even we could listen to – by sampling and understanding smells. Humans are among the smelliest animals. And very capable in telling smells apart, even if the only difference in two molecules is that their structures are mirror images of one another. But unlike dogs that appreciate a garbage bin as much as we appreciate the smell of fresh flowers, we don’t properly interpret smells and like to complain about body odors. As we don’t know all that much about chemical nature of our surroundings and rely on context and psychological factors, like feeling an intrusion in our experiences of the world. Maybe we have something to learn from the science of smells? 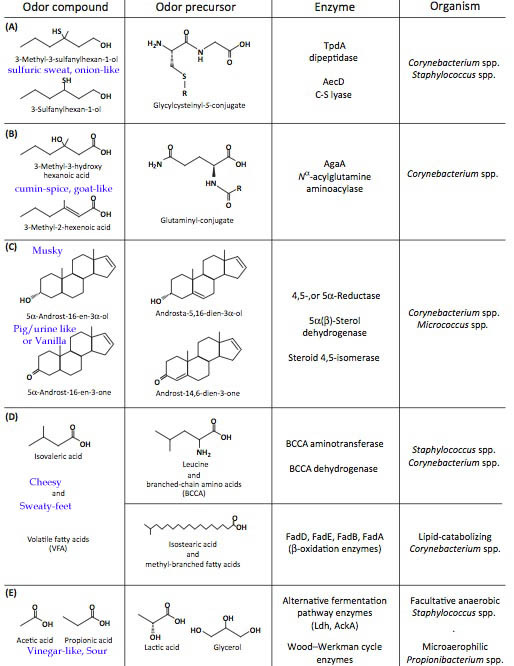 In a recent review of axillary microbiota, German researchers gave a good lesson in organic chemistry, listing major chemicals, enzymes and microbes responsible for body odor. Let’s take a look. As was also shown in previous studies, Staphylococcus and Corynebacterium spp. are the most abundant organisms colonizing moist areas and emitting chicken-sulfury, onion-like and clary-sage like odors. The strain of Staphylococcus haemolyticus is producing one of the most offensive sulfury smells. Corynebacterium jeikeium K411 is another species that can compete on the strength of the odor. The major odor-causing substances are sulphanyl alkanols, steroid derivatives and short volatile branched-chain fatty acids. Most common sulphanyl alkanol in human sweat, 3-methyl-3-sulfanylhexan-1-ol is produced by bacteria in several ways, particularly in glutathione biodetoxification pathway, from molecules synthesized after consuming proteins (due to aminoacids L-cysteine, L-glutamic acid and glycin). This chemical, besides being a major descriptor of human sweat odor, is also present in beers. Its S-enantiomer (75%) is described as a classical body odor (sweat) with onion-like tones. Interestingly, the opposite enantiomer, (R)-3-methyl-3-sulfanylhexan-1-ol, is fruity and grapefruit-like. Another set of molecules produced by Corinebacterium are most prominent in Caucasian men and some Asians. The odor is hircine – resembling of goats with fatty and cheesy notes or cumin-spice like. The food sources contributing to this odor are proteins and animal fats. Pheromones androstenol and androstenone, metabolites of sexual hormones, are also odorous. The latter is especially interesting as to some of us it smells like vanilla while to others is smells like urine. Sweaty-feet and cheesy smelling isovaleric and propionic acids and sour-vinegary acetic acid are also adding to the spectrum of human odors. They can smell different to different people too – some people have genetic makeup making them hypersensitive to these smells, but others are much more tolerant and forgiving. The food sources of sourish smells are protein-rich. Lactic acid is found in cheeses, yogurt, soy sauce, sourdough, meats and pickled vegetables. It can be also produced from the breakdown of carbohydrates during exercise and used as additional fuel. Glycerol is created from triglycerides found in fats and oils. So next time you are exposed to body odor, try to understand what could be causing it. It is not easy as it is a combination of many factors such as hormonal fluctuations, mental or physical stress, metabolism and microbes. It could be perfectly normal or result from a medical condition of the person who has the smell and your own olfactory abilities. But the smells are fascinating clues to health and the basics can be learned by most everyone.